Post-Script: I suppose, counting the Clip 2, it would be ten cameras. I did an initial round of test-exposures for the nine little pinhole cameras, and everything worked as expected. My hand-fashioned pinholes are close enough in size to each other that I don't need a different focal ratio (and hence exposure time) for each camera; which was my objective. The Narrative Clip 2 is really designed for life-logging by people who are always connected via smart phone; whereas my objective is more purposeful. I also don't want all those many photos uploading to someone else's server, I'd rather sort through them myself, delete the junk files (because a life-logging camera will produce a ton of junk images, at a rate of one per every 30 or 60 seconds, for example), and keep (and control the usage of) the rest. But the app enables one to also control the settings of the camera, including how often pictures are automatically recorded, and the length of video clips, etc. Though I haven't tried it with the new iOS version 9-dot-something on my iPad 2, I couldn't download the Narrative app with the older version 7-dot-something; nor was the Android app version compatible with my Dell tablet; hence why I'm for now using the PC version and downloading the images via USB straight to my hard drives. And just in case you were wondering, I don't carry a "smart" phone, instead opting for a "dumb" (i.e. "flip") phone, whose service plan only costs me $15 per month. Not because I'm a Luddite but because, one, I'm cheap; and two, I have a "smart" phone for work, and detest the thing's constant desire to be fondled and caressed, like some poor, neglected child with psychological issues. Also, I enjoy ending calls by slamming the flip-phone shut, with that satisfying, tactile ker-thwack; much better than poking at a smudgy glass screen. Post-Script: Because of a technical glitch, this video didn't include any footage of me actually typing. I had attempted a time-lapse sequence of me typing, set to record a frame once every ten seconds. It seemed to have recorded the sequence correctly, since it played back in-camera as I intended; but once I imported the footage to the iPad it was merely a large set of still images. I obviously haven't done my homework regarding how these things work. Instead, I should have used the camera's 300% speed mode, which would have accomplished nearly the same effect but rendered as a conventional video clip. Overall, I'm still satisfied with using the iPad as an editing platform, but am aware of the need to expand my library of background music, since I'm currently stuck with iMovie's default theme music selection. I need to find a good free-ware music source. Here's a link to this week's video. I hope you enjoy it. Typecast via Hermes 3000 Nekkid-Riter. 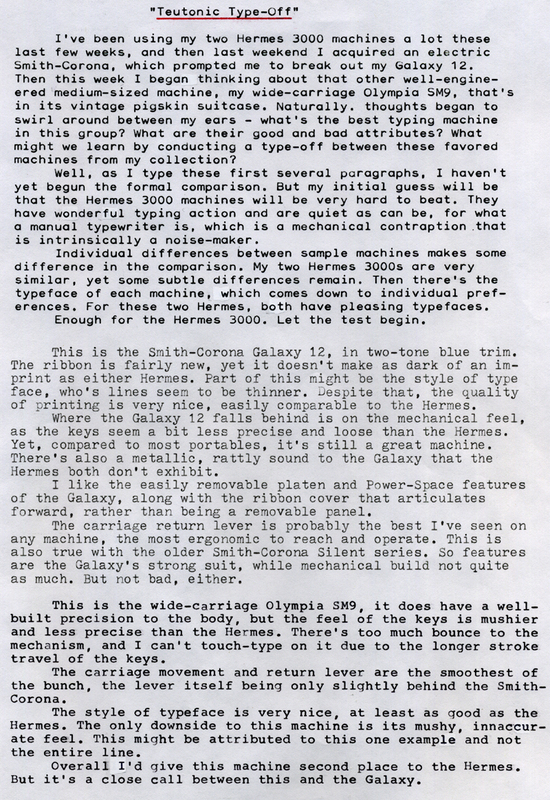 I attempted some touch-typing with this article, which might be obvious due to numerous typos and general sloppiness. Near the end of the piece I set the touch selector from "2" to "3" and noticed, with this particular machine, that it seemed to perform better on a heavier setting. 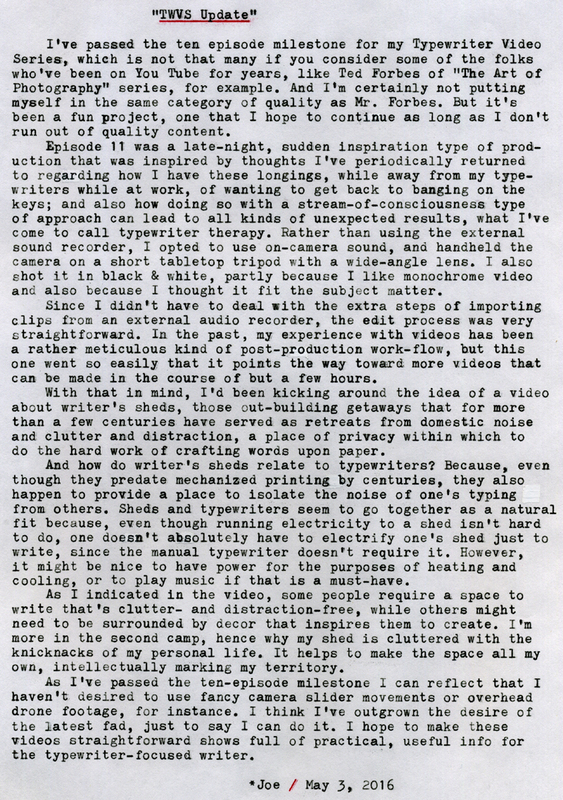 Obviously I'm not going to become a better manual touch-typist without more practice, but having the machine properly set up is also important. 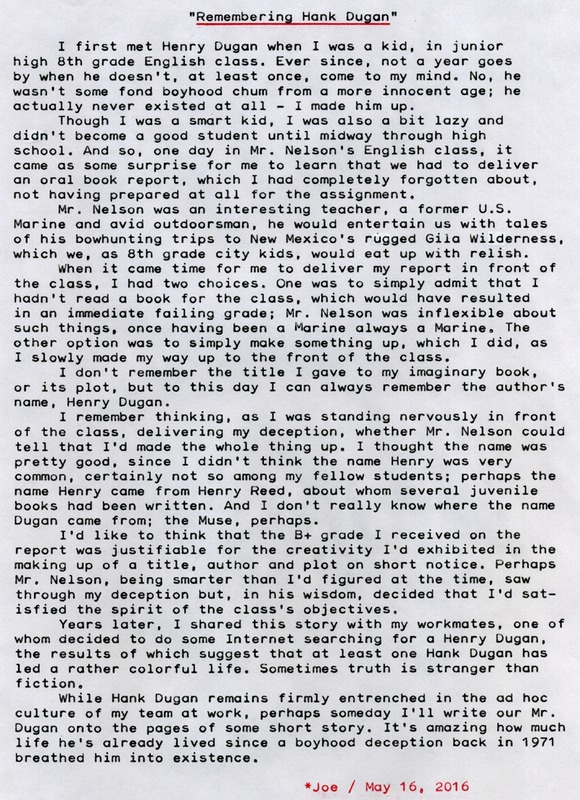 Post-Script: I didn't develop an extracurricular interest in story writing until midway through high school, though I'd like to think that somehow the genesis of Hank Dugan was the start of it all. A person often doesn't see such patterns in life until, years later, you stop to reflect. 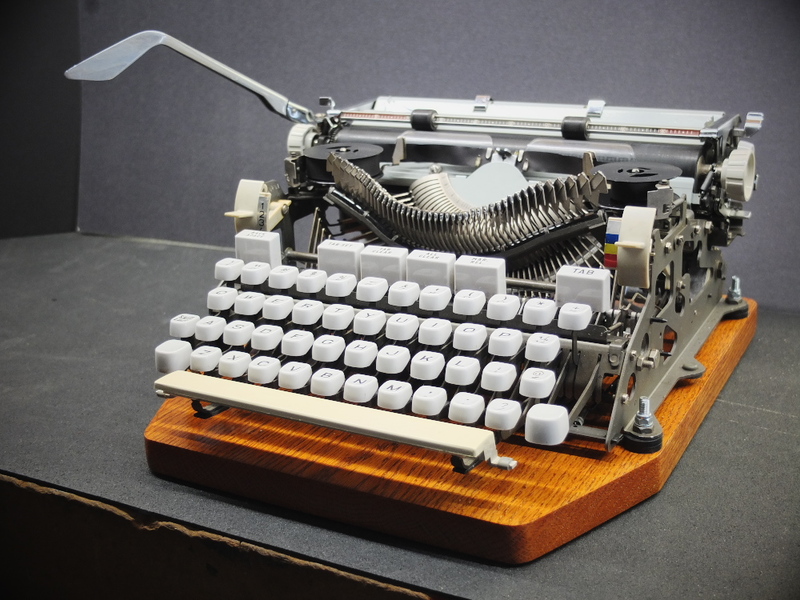 Typecast via (fully clothed) Hermes 3000. 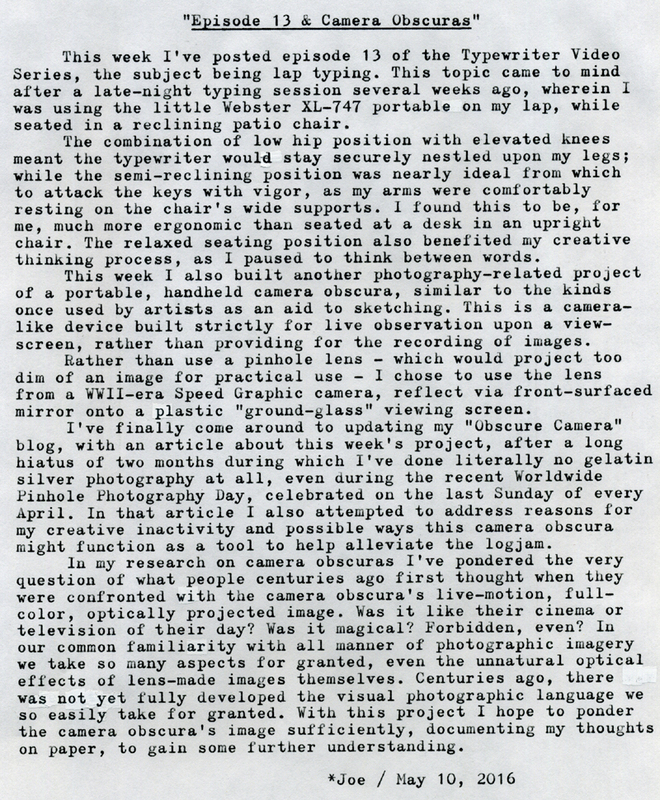 Post-Script: My Obscure Camera blog article is here. Here's the website for Worldwide Pinhole Photography Day. Be sure to check out all the gallery images from pinhole photographers around the world. Typecast via Hermes 3000 "Nekkid-Riter." 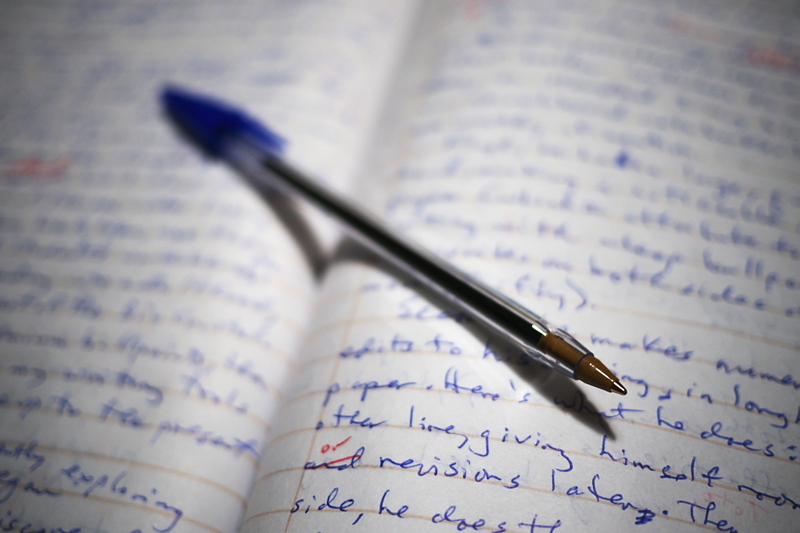 Post-Script: This blog post was typed out in one pass, without any first-drafting, as I do some of my articles. 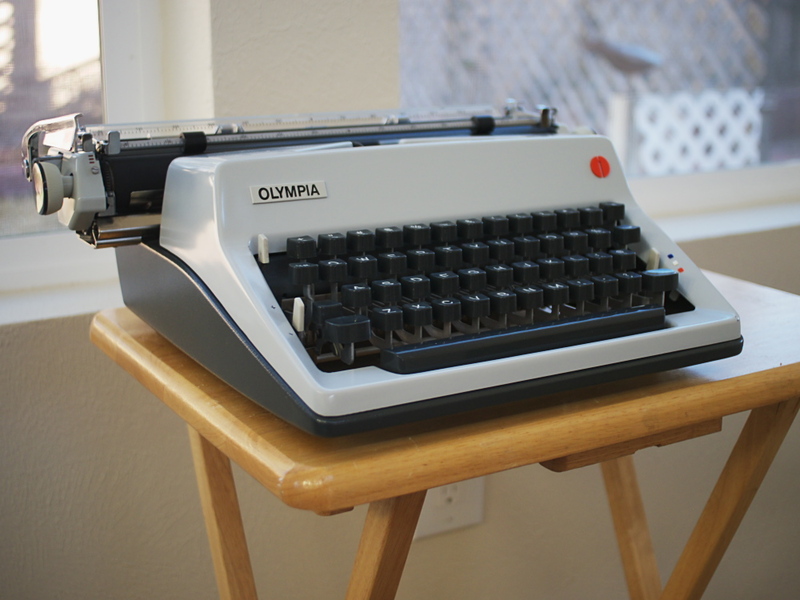 This little Brother-made Webster XL-747 typewriter makes for a great "lap typer," a category of typewriter that perhaps deserves its own future episode of the video series. It does require noticeably more finger force to get a dark imprint, as compared to those Swiss-made Hermes machines that I bragged about in the last article; but then I noticed that sitting in my low-slung patio chair, in a slightly reclined position with this small machine on my lap, offered me a better wrist position with which to attach the keys, making it suddenly easier to get the force required for a dark imprint. So perhaps the "low-rider" is a sub-category of lap typers. My Panasonic Lumix G5, which I use on all these videos, is starting to have some issues with its flip-out LCD screen. This is a great feature to have on a camera intended to be used for self-made videos, since the flip-out screen enables you to see yourself while in front of the lens. But the screen hinge has been getting loose, and now there's some flaky issue happening with the picture in the LCD itself. Perhaps I see a replacement Lumix micro-4/3 camera in my future? My personal finance manager doesn't seem to be as thrilled about that idea as myself, however. Post-Script: Yes, I know the title's inaccurate, since neither the Hermes nor Smith-Corona can accurately be termed "Teutonic;" but I needed an alliterative title and that was the first thing that came to mind. This was a fun comparison to do on a windy and cold Sunday morning. 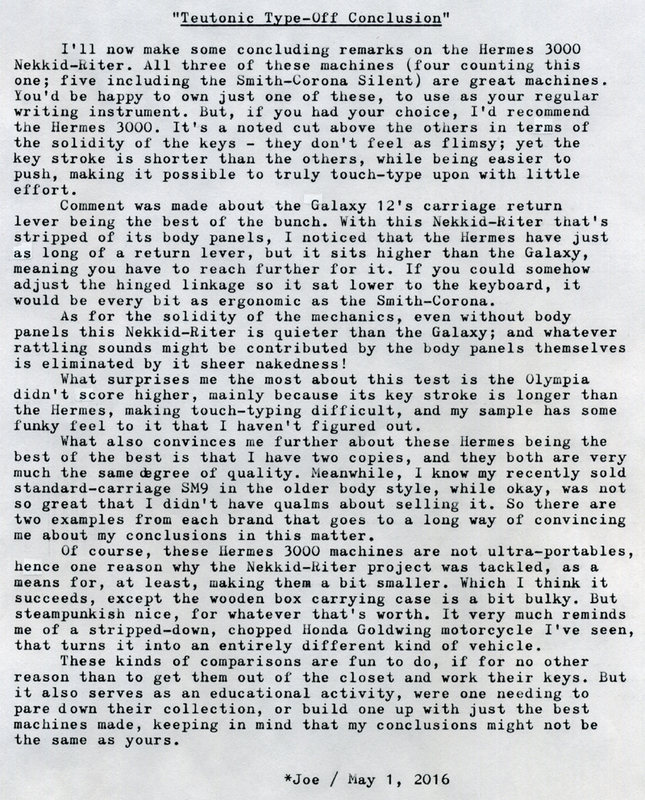 As I indicated in the concluding remarks above, it serves as an informational test that might help me decide for or against any potential future typewriter purchase I might consider. I don't see myself buying another Galaxy-series machine, for example; not because they're bad machines, but because I already have a nice one, and they're rather large - and both H3Ks are more preferable. I'd rather, if the opportunity presented itself, consider another Silent or Silent Super model, in a different typeface and body color, since these are smaller, more portable machines. And should another Hermes 3000 come my way, I'd be hard pressed to pass it up, especially if it had a different typeface. 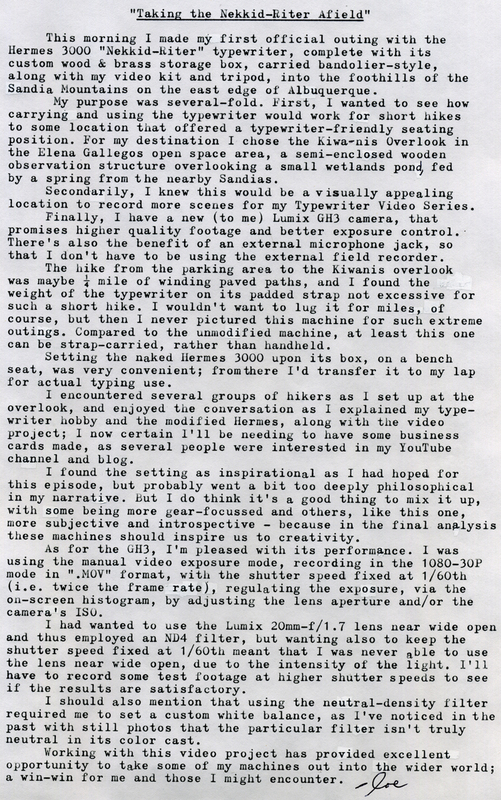 Another thing to consider in conclusion are the sample-to-sample variations between otherwise nearly identical machines. 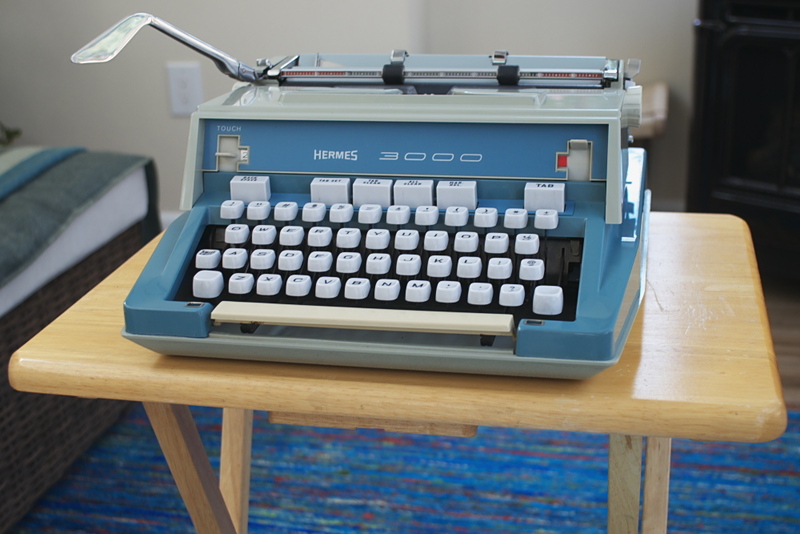 While there are subtle differences between my two Hermes 3000s, they're pretty close together in quality, which is as one would expect of a machine made to exacting standards - as long as they've been treated gently throughout the years. 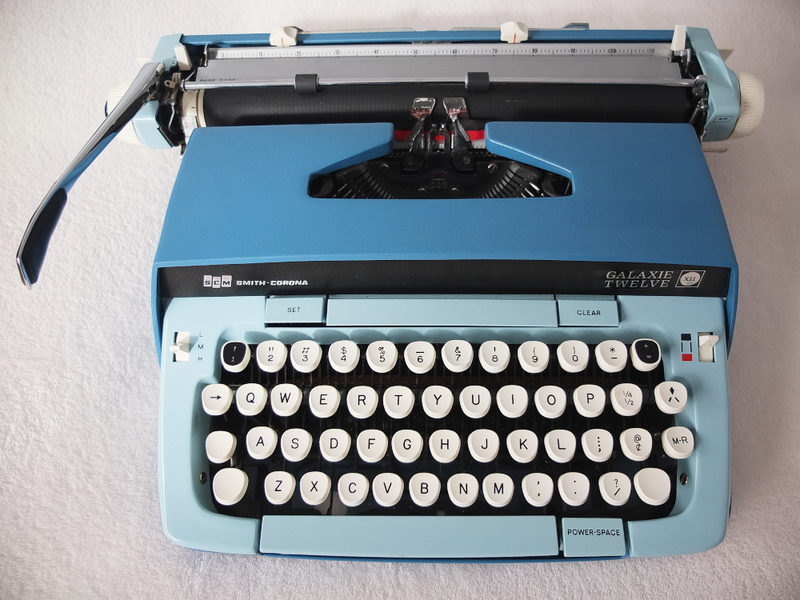 The Nekkid-Riter, it should be noted, came to me in much worse condition than the blue H3K, which was purchased from a typewriter shop some years ago. Despite those differences in condition and provenance, both machines type very nicely, which says something significant of their design and construction. Typefaces are another point of comparison, even between identical models, as evidenced by my two Hermes presented herein. 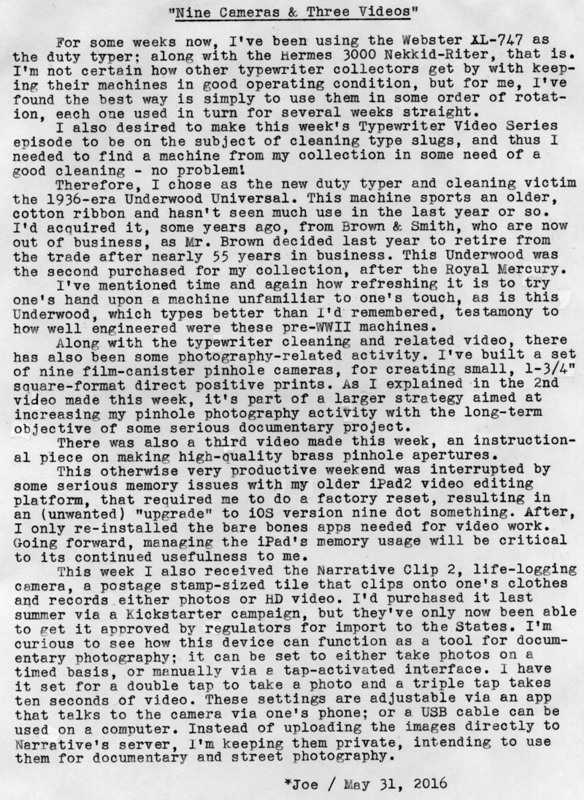 This becomes another reason to consider purchasing what would otherwise become a redundant member of one's collection, if the typeface were more pleasing as compared to a machine already in one's possession. This was one main reason why I decided to sell off the older, standard-carriage Olympia SM9, as the typeface was less pleasing to me. This might be a fun test to do with my ultra-portable machines, so look forward to that in the coming days.